Matira Beach is a mile of exquisite white sand at the southern tip of Bora Bora Island. When you visit, you will understand why it is Bora Bora’s most popular public beach. It stretches from Hotel Bora Bora to Matira Point and is framed from behind by lush palms and green hills. To each side there are more long strips of privately owned beaches. On the eastern side, several 4 and 5 star Bora Bora resorts nestle along the other side of Point Matira and have great views of the Beach. Le Moana Intercontinental Bora Bora resort is just across the road. It’s authentic Polynesian charm also offers the freedom of easy walking to this great beach and the nearby shops and cafes. The luxurious Intercontinental Resort & Thalasso Spa has it’s dock here, so their guests can ride across the lagoon to visit. Point matira, with the Intercontinental Le Moana on the East side. Often described as the most beautiful beach in the world, Matira Beach is actually the only public beach on the main island that is worth a visit. It is so gorgeous! Everybody is welcome on this expanse of sand. There is a fun atmosphere that offers natural shade from palm trees, safe swimming and easy snorkeling. The white sand slopes gently into a sandy bottomed lagoon so the water is warm and shallow. The floor is flat and has a sandy, coral-free bottom to walk on. I have not seen any children there, but if you are traveling with your family, this would be a wonderful place for children to swim and play. During low tide, you can wade from Matira Point, across the shallows, out to the barrier reef. This shallow water is what makes it impossible to sail around the island in a yacht. You can stay right on the beach at the Hotel Matira. The Intercontinental Le Moana is on the other side of Point Matira, so is a short stroll across the road to Matira Beach. The Le Moana has its own private white sand beach also, and has views down to Mt otemanu. What to do at Matira Beach? After you have had enough of relaxing on the white sand, here is what to do at Matira beach. There are plently of activities and tour prividers that are available at Matira Beach, including good snorkeling. You can snorkel straight off the beach. There are two great spots. Head to the northern point where the Hotel Bora Bora sits. Currently closed for a complete reconstruction, it was the first luxury resort with over-water bungalows, so has magnificent mature coral heads. Explore the lagoon, below the Bora Bora Hotel’s over water bungalow area, with your snorkel to marvel at the array of fish. Then venture around to the east side of the Beach and down to it’s southern-most point. Swim out towards the northern edge of the barrier reef. This takes you close to the coral gardens, affectionately named ‘the aquarium’ by the locals, where there are hundreds of colourful tropical fish species to discover. An interesting walking trail, starting from the eastern side of Matira Beach, enables you to hike up to a strategic location where coastal defence guns were placed by the US military during WWII. They never had to be fired. 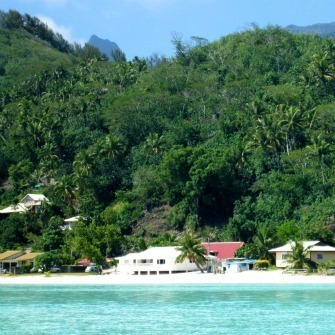 From here you have a stunning view across the lagoon to Mount Otemanu and Motu Toopua. There are a few Jet Ski companies to choose from in Bora Bora. Matira Jet Tours can be found on the Matira Point side of the beach. Phone: 67.62.73. to book a tour and arrange for them to pick you up from your hotel. They provide Jet Ski Bora Bora tours with swimming and snorkeling stops. They also offer a unique Bora Bora experience of riding a jet ski across the lagoon to Motu Roa. Here you explore the plantations, forests and beaches on a Quad Bike. This Bora Bora tour includes a beach picnic with a view overlooking Bora Bora Island. If you get hungry and like simple value-for-money food I can recommend Ben’s. You can lap up some friendly island service here. Ben will offer you an ice cold Hinano beer and chat while his wife cooks you up succulent fresh grilled fish and french fries. Follow the circle island road north from the beach, towards Vaitape until you see a romantic pier that welcomes the arrival of guests by water. Across the road, flanked by graceful palms, you will discover Bloody Mary’s bar and restaurant. You can stroll in with your sandy beach feet and feel welcome. It’s worth a visit just to sit on tree trunk stools and experience the atmosphere. I like to relax with a cocktail when stopping at Bloody Mary’s on my way to Matira Beach or back. Matira beach is family friendly. There is plently of clean, white sand for the kids to play in. The water is calm and shallow (never any big waves), so it is a very safe swimming area children. There is not any equiptment available, like what is provided at the Bora Bora resorts, so bring your own floaties, snorkeling gear etc. 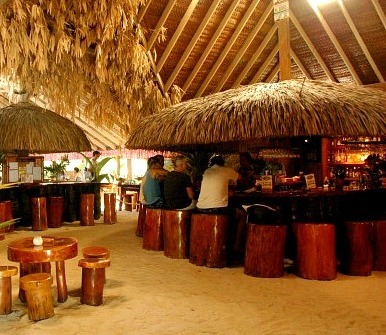 You can eat and drink right on the Beach at a couple of casual cafes. For finer dining, stroll down Point Matira to the Matira Beach restaurant. It is open for lunch and dinner daily (closed on Monday), specializing in sushi and Tahitian specialties. 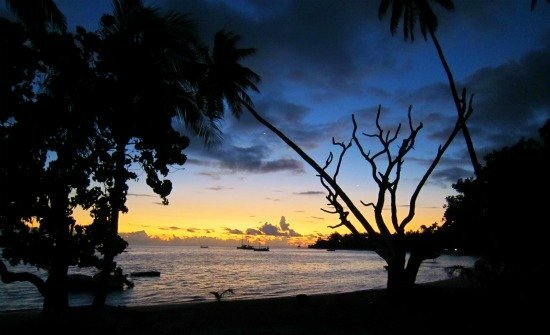 This western-facing beach is renowned for beautiful sunsets. Bora Bora taxi fares go up after 7pm. But the sunset moments are worth it. The 26 natural atolls or atholhu in Dhivehi — the source of the English word, of the Maldives are not single islands, but giant ringlike coral formations hundreds of kilometres wide that have fragmented into several islands, sand banks and lagoons. The Maldives islands are grouped into large, ring-shaped coral reefs. The land area of an island average only one to two square kilometers, and is between one and 1.5 meters above sea level. The islands of the Maldives has no hills as it is entirely made of coral sand. Islands are too small to have rivers, but small lakes and marshes can be found in some of them. Some islands are marshy, while others are higher owing to sand and gravel having been piled up by wave action and tidal changes. The soil is highly alkaline, and a deficiency in nitrogen, potash, and iron limiting the potential for sustainable agricultural produce. The weather in the Maldives is usually picture perfect: sunlit days, breezy nights, balmy mornings, and iridescent sunsets. The temperature hardly ever changes – which makes packing for your holiday an easy task (see what to pack). With the average temperature at about 30 degrees Celsius throughout the year, the sun is a constant on most days, shining through treetops, creating lacy patterns on your feet, healing cold-bones with its warmth. Throughout the day, the sun will make itself known, ensuring that it will be remembered and missed, like an old friend, as you pack up your suitcases to leave. Maldives has two distinct seasons; dry season (northeast monsoon) and wet season (southwest monsoon), with the former extending from January to March and the latter from mid-May to November. The rare thunderstorm in the Maldives (especially around the southwest monsoon months) can be a welcome respite from the sun. Cloudy skies and slate grey seas, and crashing thunder makes up for lovely reading weather. The warm temperatures will allow you to go for a walk in the rain, a verdant, wet, thoroughly enjoyable experience. For extra exhilaration, take a swim in the rain – the sea will be extra warm. Ever imagined what it would be like to live underwater with the beautiful fishes and colorful corals? That dream could come true. 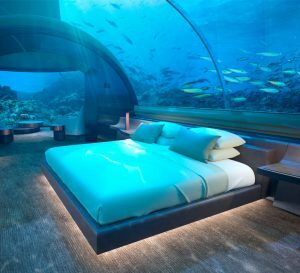 Conrad Maldives Rangali Island Resort is introducing an exclusive underwater hotel suite, The Muraka. The suite sits 16 feet below the horizon. Crystal clear turquoise water surrounds the entire suite from the bedroom to living area and to the bathroom. The glass dome allows you to enjoy your holiday with a mystical view. 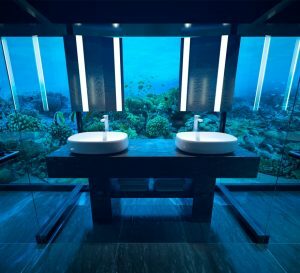 The master bedroom will give you the feeling of living in an aquarium. By heading to the surface you can reach the additional living room, bedrooms and infinity pools. The walls made up of glass allows you to enjoy sunsets and sunrise, views of waves and private jetty. Residents can either choose to descend by an elevator or follow a spiral staircase down to enter the underwater heaven. Guests who stay in Muraka are flown in a private seaplane that lands at their private jetty or are picked up from the main resort in a speedboat and will be theirs to use for the rest of their stay. Muraka itself sits out in the ocean far from Conrad’s water bungalows and beach villas, to give full privacy for the guests. This unique hotel suite is not like any other and comes with several benefits and services. A dedicated staff, including a butler and chef, to enable 24/7 services. In addition to services from massage therapists to a beautician to trainers can be arranged. A stay at this lavish hotel suite costs approximately $50,000 per night. restaurant, also known as worlds first underwater restaurant. Experience the incredible Soneva Fushi resort. This innovative hotels in the Maldives has set a standard to which others will aspire, with its unique approach to eco-friendly luxury living. As you wake up and stroll outside onto the private beach, you will feel as though you are in your very own world. Yet, all of the amenities you could desire from any luxury holiday to the Maldives are at your fingertips in this exclusive retreat. Nestled among 100 acres of verdant greenery of the UNESCO Biosphere Reserve, Baa Atoll, Soneva Fushi is an inspiring escape. If you are looking for barefoot luxury, this resort’s philosophy will resonate: no news, no shoes. From the stylishly minimalist design of the undeniably impressive accommodation, where rooms and villas are crafted out of sustainable woods and natural fabrics, to the incredible facilities the resort boasts, such as an open-air cinema and observatory, this resort never fails to impress. Each room gives breathtaking views of the pristine beaches and glistening turquoise lagoons, with the Indian Ocean just a few footsteps away. The island breeze awaits your call, and the balmy waters will greet you as you dip your toes in the sea for the first time. The cuisine on this delightful island is as diverse as the accommodation, with a choice of gourmet restaurants, including the renowned organic ‘Fresh in the Garden’ and the impressive wine cellar boasting over 7,000 fine tipples to taste. Whether you dream of diving with manta rays and spotting dolphins by sunset, or simply desire a classic Maldives holiday spent lounging in the sun after an indulgent spa treatment, Soneva Fushi will realise all of your wishes – and more. Discover all of our dining destinations and experiences available at Soneva Fushi and on the untouched islands surrounding us. Our Hosts are happy to customise each experience for a special occasion, celebration, or simply just because. Surrounded by tropical banana trees, this restaurant without walls rises above our herb and vegetable garden with sublime panoramas stretching as far as the eye can see. Named after Chef Sobah, Sobah’s is a restaurant located on an uninhabited island only 15 minutes away by speedboat from Soneva Fushi, serving uniquely Maldivian dishes with modern twists. The cuisine is uniquely Maldivian with modern twists, prepared using traditional cooking methods. The beach restaurant seats only 18 for dinner and is open two nights per week, subject to a minimum number of diners. After dinner, guests will be introduced to the starry night sky by our resident Astronomer. In the words of Oscar Wilde, “nothing succeeds like excess.” In that spirit we have gone delightfully overboard for you at Mihiree Mitha, which means “here it is” in Dhivehi, and almost any dish you crave can be found at our buffet. Begin your day with baked goodies, imported cheeses, eggs every way possible and a treasure chest of jams and fresh fruits. For lunch or dinner, choose from sushi and sashimi, organic salads, wood-fired pizzas, curries, fish and tandoori. More than 30 homemade ice creams and sorbets await your sweet tooth, along with our homemade chocolates and desserts. The sharing of food is a primal bonding ritual. Families around a table, tribes around a fire, kin around a hearth. We sought to recreate this intimacy with dishes designed for sharing. In one of the world’s most exquisite destinations, cherish a sense of togetherness as you and your loved ones share a mouthwatering spread of crowd-pleasing dishes. Open daily from 11am onwards. Out of the Blue rises out of the majestic Indian Ocean, offering diners panoramic views of the Baa Atoll. Relax on the open deck or take a ride down the water slide. Out of the Blue mimics natures gentle curves with its sloping silver roofs and mesmerising free-form design. This space shares a seating area with Nikki @ Out of the Blue and the Chinese Kitchen. Guests can choose from offerings of international dishes including pizzas, salads, and grilled meats and seafood. This area will also include: So Hot – a tandoor oven, robata grill, josper grill and pizza area; So Chilled – the chocolate and ice-cream parlours; So Fresh – the first overwater organic greenhouse in the Maldives; and So Cheesy – our cheese room. Open all week for lunch only. A culinary theatre showcasing some of the biggest names in fine dining. Open for dinner only on Monday, Thursday, and Sunday. So Hands On is our sushi counter that will play host to some of the world’s best sushi chefs. Chef Akira Koba will be running the table year-round. Open for lunch on Monday, Wednesday and Friday. Open for dinner on Monday, Wednesday, Thursday, Friday and Sunday. Flames and smoke set the stage for So Bespoke by Katsuhiro To, Out of the Blue’s Teppanyaki table. Our very own Chef Nikki heads up Nikki @ Out of the Blue, serving modern style sashimi, black cod and other Japanese favourites with a contemporary twist. Open for lunch and dinner on Monday, Wednesday, Thursday, Friday and Sunday. This kitchen serves diners from its glowing open grills and flame-laced woks. Modern Chinese cuisine will tantalise and satiate the appetite. Choose from our collection of more than 200 high-end wines by the glass, not to mention a wide selection of beers, spirits and cocktails. Browse our unique selection of memorable, fun and once-in-a-lifetime experiences that we have on offer at Soneva Fushi. From thrilling water sports, an introduction to the art of glass blowing, to cultural excursions to nearby local islands. Take your castaway island experience to another level, and try Sonu’s favourite – lunch on a desert island prepared by your own personal chef. Soneva Fushi houses the only Glass Studio in the Maldives. Our Glass Team uses 100% recycled glass to create functional and artistic pieces. Enjoy the truly rare experience of learning how to blow glass at Soneva Fushi’s own glass art studio. Created for our young guests aged 4 to 12 , the Den is where they can unleash their imagination, creativity and curiosity. Explore the outdoor pirate ship, take cooking or mocktail making lessons, learn a musical instrument or take part in arts and crafts. Our child caretakers are always on hand watch over their every move, while you enjoy some deserved quiet time. There is a pool for toddlers and one for older children, while there is a separate area for teenagers to lounge in. Peer through the lens of our state-of-the-art telescope and gaze upon celestial bodies out in the night sky. Freediving is the exhilarating practice of discovering the underwater world using only a single breath. You will learn our finning technique – how to propel thorough the ocean, increase your breath hold capacity, the ability to both relax and focus, equalisation and of course safety, which is paramount. The Freediving courses consist of theory lessons, breathing and relaxation techniques, stretching, confined water and open water practice. Guests will learn about what happens in the human physiology when we Freedive, about the physics of water, about mental capacities, deep relaxation and breathing techniques to improve health and well being. The breathing techniques are the key factor for Freediving and these can be used anytime anywhere, in ones daily life back home. In the water you will learn how to move more graciously, thereby saving energy. Snorkel the Baa Atoll in search of Manta Rays in Hanifaru Bay, which has one of the world’s largest populations of Manta Rays. Conditions permitting, fortunate guests might get to see hundreds of Mantas as they gorge themselves on plankton. There are several locations where Mantas can be spotted, so the itinerary may vary. If there are no Mantas, our Marine Biologist will take you to another snorkelling spot. *June – November. Manta sightings are frequent but not guaranteed. The Soleni Dive Centre’s multi-lingual PADI instructors and the small group sizes ensure world-class diving experiences. The numerous dive sites around the resort are sure to tempt all marine enthusiasts. Equipment may be rented. For more information, duration and price please visit the Soleni Dive Centre website. Get ready for one of our most sought-after experiences; watching dozens of playful dolphins in the light of the setting sun. While you cruise ever deeper out into the sea, you will be served a selection of canapés and a flute of Champagne. Relish seeing these incredibly intelligent creatures that call our oceans their home. Cruise the calm waters as these sleek and lightning quick animals come out to play, leaping out of the water alongside the bow of the boat. Enjoy the sunset accompanied by the beats of traditional Maldivian Boduberu drums. Discover less chartered and secret surf breaks in the Baa and Noonu Atoll accompanied by our experienced surf instructor/guides. All surf breaks are accessible within a 5-35 minute speedboat ride. Surf season is dependent on Mother Nature’s mood, although it does peak from May through to September. Waves range from waist to head height. All of our equipment is eco-friendly and made from recycled waste, making us the first fully sustainable surfing programme in the world. We encourage our guests to leave their equipment at home. We provide full usage of our eco friendly and sustainable surfboards, sunscreen, and rash guards. All items (except for surfboards) are also available for retail. This is offered for first timers in the safe and shallow waters of our lagoon. Surf trip to secret and uncrowded surf breaks around the Atoll accompanied by a surf instructor/guide. Water and nutritious snacks are included. An exhilarating way to connect with the vast blue ocean. Our surf instructors know the Maldivian waters like the backs of their hands. The Baa Atoll is the Maldives’ only UNESCO World Biosphere Reserve, with dolphins and manta rays paying frequent visits. The surf breaks around our resort cater skill levels from beginner to advanced, making it a great location for taking up surfing for the first time. Waves lap at the shore. Breezes rustle the treetops and stars shine on screen and overhead. We invite you to join a classic film screening in our open-air theatre. Lie back in your cushioned lounger and immerse yourself in the magic of Cinema Paradiso. Complimentary popcorn and over 60 different flavours of ice cream are the perfect munchies for our on-the-sands theatre experience. Should you desire a chilled cocktail, or something more substantial, our cinema hosts will be happy to oblige. Cinema Paradiso has two showings each week, showcasing classic films and modern favourites. Soneva Fushi frequently welcomes inspiring guest speakers to talk at Cinema Paradiso, such as Buzz Aldrin, Sir Robin Knox-Johnston, Sir Mo Farah and celebrities such as Stanley Tucci and Liv Tyler. Spend a romantic night camping under the Maldivian skies on your own private sandbank in a luxurious Bedouin-style tent, which comes with its own water closet. Make your way to a candlelit dinner, set up by personal attendants before they depart to allow you to experience the unspoiled island. Breakfast will be delivered at a pre-arranged time of your choice. Cherish time spent being truly alone, with only the sounds of the sea to keep you company. A luxurious tent, snorkel masks, and the one you love; you have everything you need for the evening. With nothing but the blue sea, soft waves and the occasional dolphin to distract you. Join us for an astronomical adventure, where you head out into the Indian Ocean for a dining experience under a blanket of stars. Enjoy dinner and wines while watching the sun set over the Indian Ocean, before learning the secrets of the sky from our resident Astronomer. Humankind has used the skies above for millennia to tell stories, find their way, make predictions and plan their harvests and planting seasons. Learn how Maldivians have harnessed the heavens to guide their lives. With little to no light pollution and an advantageous location near the equator, the Maldives is the perfect location to spot celestial objects and constellations from both the Northern and Southern skies. Gliding. Diving. All of this is possible with a SEABOB, learn to move through the water like a fish – both on the surface and beneath the waves. The SEABOB is environmentally friendly, moving powerfully and almost silently through the water. Experience the ocean with the complete freedom of the SEABOB. Its shape leaves it agile in the water, making steering and diving incredibly simple, all it requires is for the pilot to shift their bodyweight. Dive into the depths or cruise along the surface, the choice is yours with minimum effort. We offer a range of complimentary non-motorised water sports at Soneva Fushi. This includes kayaking, stand-up paddleboarding, windsurfing and catamaran sailing. Private tuition is available at an additional charge on an hourly basis. Take our paddleboards out into the ocean, they are fantastic for your core stability and leg strength. Hit the ocean to feel the cooling sea spray and the pull of the wind in your sail.